Discover Paris in a festive mood, where you can hop on board and let yourself be amazed by the main monuments in Paris situated along the Seine River while sipping a cup of champagne. Share with your partner a champagne tasting experience on board this 70 minute sightseeing cruise with commentary on a double decker boat. This experience for two is entertaining, romantic, and an absolutely "sparkling" experience! Please note that there are many start times throughout the day, and this will be a shared experience with as many as 1000 people per boat. - There is almost no limit concerning the number of people attending this event. Come on board and discover the French capital by boat in a glamorous way! This "sparkling" cruise shall provide you the chance to sail along the Seine river for 1 hour and 10 minutes and taste some fine French champagne. This is a guided sightseeing cruise which will allow you to discover the main monuments from Paris and their history. This package for 2 is perfect for those of you looking for a moment of cultural exploring and shared relaxation. 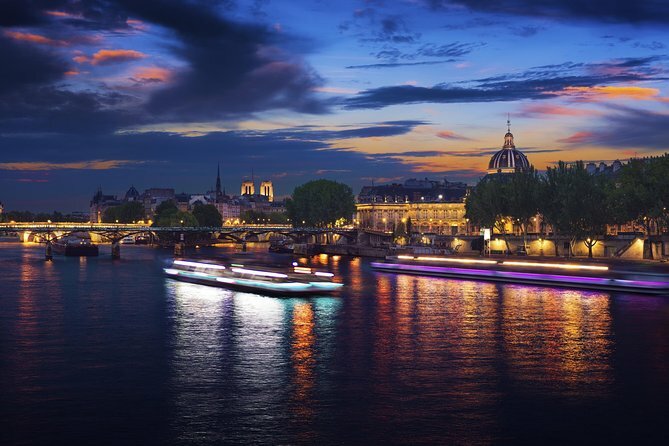 Multiple start times by day or by night, at sunset or at sundown, this sparkling cruise invites you to find out more about the marvelous monuments from the city of lights. The Eiffel Tower, the Louvre Museum, the City Island which is the historical birth place of Paris with its numerous monuments like the Notre Dame Cathedral, or the Conciergerie are just a few of the tourist spotlights which you may discover during this 70 minutes round-trip. You may come and enjoy this experience whenever you may please during the hours of operation. Bookings for a particular schedule are not required because the boats may accommodate up to 1000 people on board and the operators provides regular departures, almost every 30-45 minutes. Show up with your voucher at the boarding spot, get your 2 adult tickets for the sightseeing cruise at the ticket desk, your "sparkling bag" containing 2 cups and half bottle of champagne at the "Bar" counter and hop on board to enjoy a once in a lifetime french experience! The perfect way to taste with all of your senses the sparkling "joie de vivre" of French people. Regular departures are provided according to the cruising hours here below, throughout the whole year without any particular interruption (except bad weather conditions like floods). Beautiful views at night. Really enjoyed it. I would recommend it to anyone and have as I’ve met people. Wonderful cruise--beautiful scenery!! The information and view on the cruise was very enjoyable--would definitely recommend! Awesome. Loved the twilight cruise! Lovely to see Paris at night! An experience not to be missed. The lines are long even if you book in advance. Be prepared to wait. The sparkly comes in a cute bag with two miniature bottles and two plastic flutes. However, finding these and the bar was impossible before our cruise because of the tons of people. We were able to get them after our cruise and they were cute and delicious. The champagne was AWEFUL. After the first sip, we were done with it. Not sure if it was just cooled and then heated too many times or just plain swill to start with, but skip the Sparkling part of the trip and just take the boat ride. Unfortunately it started to drizzle as the boat started to make it's way back to the dock essentially half-way through the tour and it was a ragging thunderstorm when we disembarked. Tour itself and the commentary was wonderful. I would recommend this to anyone that want's to see Paris from the Seine just take your own beverages. Enjoyed the river trip. We could not hear the person telling about the buildings and bridges from where we stood on the top deck. Beautiful building and history.